At times I felt that knitting this scarf was a fool’s errand considering that I was doing said activity during a record hot Austin summer. But it meant something to me to finish this scarf, even if I never wear it. I had it on for like one hot minute just to get the picture done. It looks great with a tank top. It’s not quite as “ramen-y” as the first scarf I made with the booty I brought back from Pueblito Los Dominicos. But it’s the perfect shade of charcoal gray. Not too blue. Not to black. Just gray. 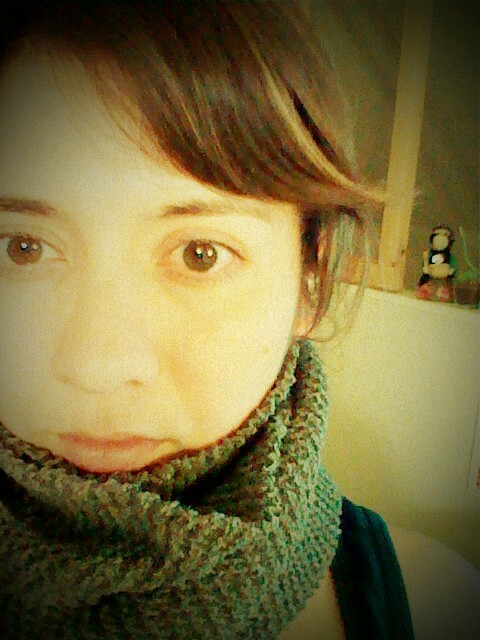 And with this gray scarf I dare to will winter towards Austin, to bring the cold winds, moody skies, and snow. I think after all we’ve suffered (“we” being all the champs that stuck it out in Tejas from May to now) two snow days are in order. One for each scarf.